[S12] C. Arnold McNaughton, The Book of Kings: A Royal Genealogy, in 3 volumes (London, U.K.: Garnstone Press, 1973), volume 1, page 458. Hereinafter cited as The Book of Kings. 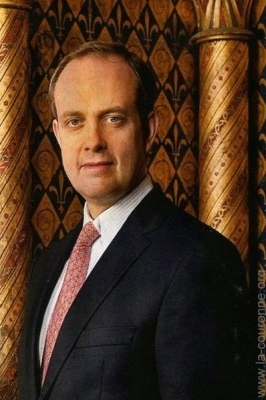 François Henri Louis Marie d'Orléans, Prince de France was born on 7 February 1961 at Boulogne-Billaincourt, Hauts-de-Seine, FranceG.1,2 He was the son of Henri Philippe Pierre Marie d'Orléans, Comte de Paris and Maria Theresa Herzogin von Württemberg.1 He died on 30 December 2017 at age 56. He gained the title of Prince François d'Orléans.1 He gained the title of Prince François de France. [S12] C. Arnold McNaughton, The Book of Kings: A Royal Genealogy, in 3 volumes (London, U.K.: Garnstone Press, 1973), volume 1, page 459. Hereinafter cited as The Book of Kings. He gained the title of Prince Jean de France.1 He gained the title of Duc de Vendôme.5 He gained the title of Prince Jean d'Orléans. He gained the title of Prince Eudes de France.1 He gained the title of Duc d'Angoulême.3 He gained the title of Prince Eudes d'Orléans. Béatrice Marie Guillemine Huguette de Pasquier de Franclieu was born on 24 October 1941 at Neuilly-sur-Seine, Paris, Île-de-France, FranceG.2 She is the daughter of Comte Bruno de Pasquier de Franclieu and Jacqueline Térisse.2 She married Michel Joseph Benoît Marie d'Orléans, Prince de France, son of Henri Robert Ferdinand Marie Louis Philippe d'Orléans, Prince de France and Isabelle Marie de Orléans Bragança e Dobrzensky de Dobrzenicz, Princeza de Orléans e Bragança, on 17 November 1967 at French Consulate General, Casablanca, MoroccoG, in a civil marriage.1 Béatrice Marie Guillemine Huguette and Michel Joseph Benoît Marie were also married in a religious ceremony on 18 November 1967 at Church of Notre-Dame des Flots, Aïn-Diab, Casablanca, MoroccoG.1 She and Michel Joseph Benoît Marie d'Orléans, Prince de France were separated in 1994. [S12] C. Arnold McNaughton, The Book of Kings: A Royal Genealogy, in 3 volumes (London, U.K.: Garnstone Press, 1973), volume 1, page 460. Hereinafter cited as The Book of Kings. [S213] Unknown author, "unknown article title," European Royal History Journal: issue XLV, page 31. Marie Joseph Elzear de Sabran-Pontevès, Duc de Sabran was born on 11 February 1908 at Curbigny, FranceG. He was the son of Elzear de Sabran-Pontevès, Comte de Sabran-Pontevès and Constance Prinzessin von Croÿ. He married Roselyne Manca-Amat de Vallambrosa on 11 January 1936 at Paris, FranceG. He died on 5 October 1973 at age 65 at Chateau d'AnsouisG.